What’s a real bargain? Below are some of my musings on how we think about price. The restaurant I probably go to most often in Seattle is a local taco joint. Their menu is simple and they execute their food well. I’ve been going pretty much since they opened. It’s a little more expensive than taco trucks but in a city that’s becoming increasingly expensive, paying around $8 or $9 for a meal is pretty good. When I leave I feel satisfied and feel as if I earned some well-earned frugality points. My wife and I also eat a good deal of seafood. Sometimes we will indulge in something nice like Black Cod, which our local Asian market had on sale for $18/lb. Typically around .5-.6 lbs is enough to feed us for a meal (with rice and veggie sides). This puts our the cost for two people around $9-11, quite a lot for a home meal. These meals feel like a splurge and sometimes induce a tinge of guilt. But the cost of the fancy-feeling Black Cod meal per person is actually less than the cost of my tacos. So why do I feel like Mr. Fancy Pants for the Black Cod and frugal for the other? A few members of my family really enjoy bargain hunting. My wife likes to look at the local ads for and pick and choose. The thing she always checks on her receipts is the % savings from a grocery store. On a typical day, it’ll be 25-35% and sometimes if there’s particularly good deals or some free stuff we may even get 50%. My mom is also a big hunter and goes to a Goodwill warehouse that sells by the pound. On a good day, she’ll spend a few bucks and be able to consign $50 or more of goods. Smart, practical consumers, right? Saving 50% sounds like a lot and but will this make a huge difference in our overall financial picture? I don’t think so. Saving 50% amounts to around $20 which can get you quite a lot of produce but frankly it’s just not that much money in the scheme of things. We are in a city where a minimum wage of $15. Is it easier to work an extra hour or to be a hawk for grocery deals? Similarly, my mom’s hunting gets some excellent bargains when you look at the amount items cost at retail, but it’s also not necessarily going to put the kids through college.. Sure these things adds up over time and saving money is a good thing but it is a relatively smallish amount of money compared to rent. You can probably scour and dig deep for all sorts of coupons, freebies and discounts on inexpensive goods. Save a dollar or two here and there. In a city like Seattle where the total cost of living is much higher for other reasons (property prices, rent), I think it’s important to acknowledge that these sorts of bargain hunting and frugality are good, but are relatively limited in their overall impact. You can work hard and save $50 on groceries for the month, but you’ll still have to write a check for $2,000 each month for your rent. One of my local grocery store (a bourgeois organic food co-op) started sourcing supposedly higher-end organic chicken that sells for $3.50 per pound. The relative price compared with your regular grocery store chicken is quite high, where you can typically find chicken for $1 to $2 per pound. You can even find rotisserie chickens for less than these organic chickens, so these new chickens end up looking quite expensive.. That is if you are comparing it relatively vs. an anchor price for whole chickens. But in a vacuum, $14.00 for 4 pounds of meat is hardly highway robbery. Of course if you don’t think there’s a difference in quality or sourcing, buy the cheaper one.. But if you think the chicken is indeed substantially better quality, I’d argue that it’s easy to make a reasonable and rational case to purchase the higher quality product. In the previous analogy with chicken, let’s think about another protein that’s inherently more expensive, say prawns. The standard, lower-end prawns I find usually come from southeast Asia and sell for ~$6-7 per pound. It’s also possible to find higher-quality products from Alaska or elsewhere, many of which sell for $20 per pound. This amounts to a similar % price difference as our chicken. But because it’s an inherently more expensive product than chicken the cost per pound ends up being much higher. Buying $6-7 may feel like you’re making the cost-effective choice, but it can also obscure the fact that cheap prawns are actually more expensive than the fancy chicken! We could also try taking this a bit further to the price of a meal going out. Even a cheap eats sort of place in Seattle like the taco place will run you up around $8 or $9. The chicken is $14 for 10-16 servings, and people call it expensive, a qualification rarely applied to the taco place. What people who call the chicken expensive really mean is that it is expensive compared to other chicken. Serving calculation. Chicken ~0.5lb/serving (bones), prawns ~0.33lb/serving. Ripe pu’erh is something where the normal price isn’t very high and we are used to not paying very much. The median price for shu pu’erh that is available to westerners comes out to around $0.11/g or about $40/cake. When a higher-end ripe i.e. the 2017 HLH Lao Mane a $405/1000g cake ($0.41/g) everyone’s immediate reaction is to freak out. In my opinion, there are two reasons for that. (a) The sticker shock, $405 is a lot of money (1KG is also a lot of tea). (b) people are comparing the cost to the average ripe pu’erh. The price only sits a little above a median young raw pu’erh production (~$0.30-$0.35/g in 2017), but is almost 4x as high as our average ripe! Similar to our chicken example when we say the boutique ripe is expensive, we don’t mean that it is expensive in a vacuum but expensive relatively. One of my theories on tea consumers is that we tend to gravitate towards a certain sort of buying and rarely deviate from it. We might be a medium-end buyer or a high-end one. Most people that are buying $0.30/g young sheng (average $0.30-$0.35/g) aren’t also spending $0.30/g on ripe pu’erh (average $0.11/g). If they did it would make them a fairly typical sheng buyer, but a very high-end ripe one.. The more likely case is that someone buying average priced ($0.30/g) young sheng person spends around average price ($0.10-$0.15/g) on ripe tea. They will probably spend somewhere around average (~$0.20/g) for Dongding Oolong. If this holds true, this implies that your tea buying isn’t always consistent in price (they’re not buying the same $/g for every tea) but follow a different pattern that places you at a similar point for each tea relative to price anchors. One thought experiment is putting yourself back 12 years to 2006. What would you actually buy?? Would it be the nicest tea available or something else? On first glance, it seems like your time machine really opens up a lot of doors.. Things like 1980s 8582 was being sold for ~$20 for a 20 gram sample? Would you hit that hard and buy multiple tongs? It’s only with the benefits of hindsight and knowing that these teas are now mostly inaccessible and sell for $36/g in some cases that it seems like a fantastic buy. $1/g buys a lot of tea some pretty premium tea now, back in 2006 that was a very high amount to spend on tea. If I’m being honest with myself, I probably would’ve just sampled it once.. It’s only relative to the current price of those teas that we know it would’ve been a good idea to buy. Breaking this pattern means being a high-end chicken buyer without necessarily becoming a high-end prawns buyer. In the bargain hunting example at the top of the page, even if you can get a huge % off your order of lower priced goods it won’t necessarily make you wealthy in the long-run. In tea’s case, breaking the pattern might mean buying nicer tea from an inherently cheaper tea category and perhaps less high-end tea from more expensive categories. In more crude terms, you’re mindfucking and rationalizing your tea expenses by looking at metrics like $/g and $/session rather than the price relative to the median of its category. Things like ripe pu’erh, heicha, and some oolongs/black teas are good candidates where the baseline price for tea isn’t expensive and to buy above average examples isn’t necessarily wallet busting. A super fancy ripe is maybe the same cost as an average young raw production.. The reverse might be holding off on something where the baseline price is already very high, like Wuyi oolongs. Sure, buying $0.25/g ripe probably feels like a splurge. But if you feel like the quality is there and you like the tea, it really isn’t any more financially irresponsible than typical sheng buying. I’d argue that we should be breaking the mold and comparing prices across tea categories more often. This may involve ignoring our intuition on what is expensive or not. If we identify instinctively as mid-tier buyers and buy around the averages we may end up with a rather large quantity of tea, maybe too much. And if we buy faster than we accumulate (as many of us do) it really doesn’t make sense to continue buying this same tier of tea. In such situations, it makes a lot more sense to slow down, buy less, and maybe aim a little higher. This entry was posted in Aged Pu'erh, Oolong, Raw Pu'erh, Ripe Pu'erh. Bookmark the permalink. I was just talking to Sean about this – $0.30/g teas were special-occasion (sheng pu’er) teas back in January of this year. Now they’re easily the median-valued teas in my stash, daily drinkers by the most literal definition, and my buying is focused on $0.35-0.50/g productions as the wisdom of “buy less, buy better” sets in. I’ve come to realise that many of my earlier (cheaper) pickups are – while decent tea – nowhere near mature enough to be enjoyable. Every now and again I’ll drink a decent hongcha – Tasty? Check. Mouthfeel? Check. Interesting aroma, aftertaste and general complexity of experience? Check check check. And 1/2-1/5th the price of any given sheng I’m drinking. Sure, the qi isn’t there, but qi is a tertiary aspect of the experience for a fair few of the shengs I enjoy. It’s also possible that the novelty and my lack of familiarity with hong is inflating my enjoyment of it. Still, mature sheng has a “thing” that I just can’t find anywhere else. I don’t know what it is, it’s not really worth the money compared to many other expenditures, yet I don’t see myself giving it up any time soon. Despite that, I feel like sheng is a game for the rich or the stupid, and I’m certainly not rich. Thanks Alex. After reading your comment, unfortunately I think I’m in the idiot club too. On a more earnest note, buy less and buy better is seriously difficult advice to follow. I looked over what I’ve bought this year and I’ll just say it’s a lot easier said than done. Nice write up, as always. The comparison between groceries and tea is apt. It’s safe to say that the most common piece of advice given to new tea drinkers—second only to ‘sample widely’—is ‘buy better tea’. 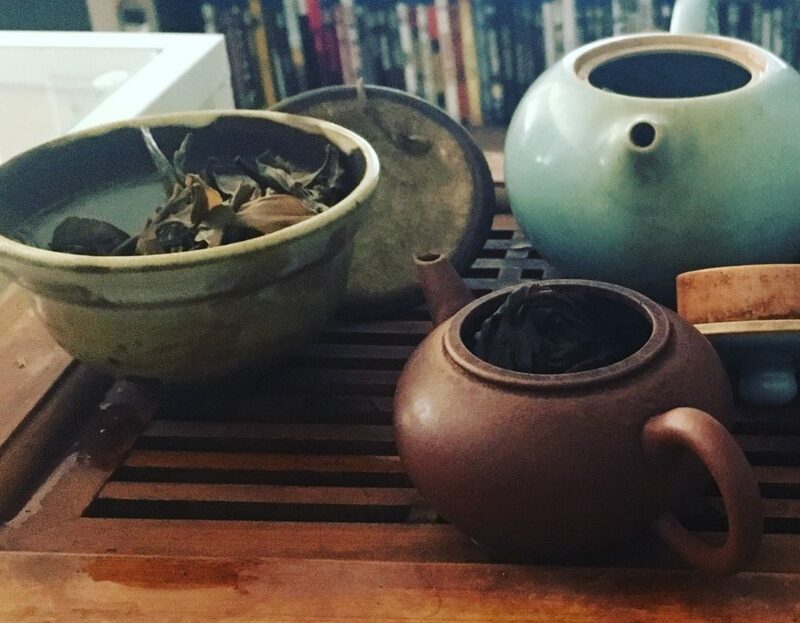 I’ve been collecting/drinking tea for a while now, but I’m not even sure what that means in practice. If I remember your older posts, the 2017 median prices are $0.11/g for shou and $0.35/g for sheng. This is good information, but it doesn’t tell me how much more ‘better’ puerh (or oolong or whatever) should cost. I think the obvious answer is that ‘better tea’ is relative to what you’re already drinking, but that only takes you so far. At this point, do you have a good sense of sheng (and oolong) what price brackets? Maybe this is something to address in a future article. Thanks Peter. Those are good points and I think you’re absolutely right. Better tea is really relative and depends. It’s a lot harder to define than cost, which we can at least quantify. There’s no real great general answer to “what is better tea”, other than sampling and trying to figure out if it the quality is worth your while. I had considered doing some sort of price bracket thing before, but it’s so subjective that I ended up scrapping the idea altogether. One takeaway for me re-reading my thoughts here is that I sometimes do a pretty bad job of following my own advice. I am often not very good at limiting my own purchasing and not necessarily great at always hitting better tea. Thanks for the comment and cheers. If you wouldn’t spend what you previous paid or wouldn’t consider to order another, then you may have overpaid for the puerh. If you would actually pay 2x as much than you initially paid, then of course it was a bargain. If you actually shell out the money to buy another cake at a higher price than, you know that first puerh cake was definitely a deal. You can poke a lot of holes in this argument, I know, but there is something really practical about it. This rings especially true for someone who has been in this position many times in the past. In a similar way Marshall’N’s “Speed Test” can be used to find out whether you actually like a cake over others. This “Replace Test” is very practical in determining if you really got a bargain. Thanks for comment. I actually like that Replace Test. It also inherently involves Marshaln’s speed test or the speed at which you drink your tea which I think is a good thing. It also forces you to be pretty familiar with the tea. In the end, I’m not sure that this article is very helpful at defining what a bargain actually is. I think how we think of price can be quite complex and often depend on how we’re anchoring price. One of my goals here was to consider how we’re anchoring price for our own tea and potential purchases. Regardless of what one buys, disposable income is the main issue. Should one be buying puerh if one cannot afford to eat out? On the other hand, making tacos at home for less than a dollar a taco could mean buying a shou that is otherwise not in the budget. I would think that whether the shou is a tuo or the HLH really comes down to what fast, ready disposable cash you have, unless it’s going on a credit card costing double or more over time. Regarding the disposable cash, what is the attitude towards it, a constant “I should save or justify every penny spent,” or “it’s my disposable cash so I don’t need to rationalize money already set aside for anything I want.” On the upside, at a certain age tea became more important than what I’m eating. Chicken did become just chicken. But I understand the Goodwill thing, a lot of jobs here pay less than buying/reselling goods purchased at Goodwill. For me, a job has to pay $20/hr or more to overtake what I can make just on eBay over the course of a month reselling using a cell phone. This article is so true on so many levels, I’ve re read it a few times. I think you nailed the buyer identity thing. For me in 2006, I was buying at a similar price anchor than I buy now, I think. So, instead of your readers overthinking this one they can pretty much just find out what price anchor they are at now. Then go back to the average price in 2006 and that’s probably the puerh they would have purchased. But this really only works for the purchase of fresh new Sheng. In 2006 not too many of us were buying aged tea at 10-30x higher prices than the price of fresh Sheng at that time. Nowadays, you can buy aged tea cheaper than fresh Sheng. In this way things have flipped. So the idea that you would even buy something from the 1980s in 2006 seems absurd unless you are buying today at the highest price anchor. I don’t think you are the kind of buyer to buy samples at the absolute highest price anchor today, so it is unlikely that you would have even purchased an 1980s sample in 2006. If you are a value puerh buyer these days you will likely be buying semi aged. But if you were a value puerh buyer in 2006 you were most certainly buying fresh Sheng. Even if you considered yourself in the middle anchor or upper middle anchor in 2006 you would still likely be buying fresh young sheng. In this way your anchor influences the age of the raw puerh you are buying as well. Thanks for the comment and the additional thoughts. I also am guilty of buying too often off of price anchors and avoiding true high-end tea.